St. Martin's Griffin, 9781250033451, 480pp. On opening day of the new baseball season a small model-kit airplane flies down from the stands and buzzes the mound, where a decorated veteran pilot is about to throw out the first ball. The toy plane is the exact replica of the one flown by the war hero. Everyone laughs, thinking it's a prank or a publicity stunt. Until it explodes, killing dozens. Seconds later a swarm of killer drones descend upon the picnicked crowd, each one carrying a powerful bomb. All across the country artificial intelligence drive systems in cars, commuter trains and even fighter planes go out of control. The death toll soars as the machines we depend upon every day are turned into engines of destruction. Joe Ledger and the Department of Military Sciences go on the hunt for whoever is controlling these machines, but the every step of the way they are met with traps and shocks that strike to the very heart of the DMS. No one is safe. Nowhere is safe. Enemies old and new rise as America burns. 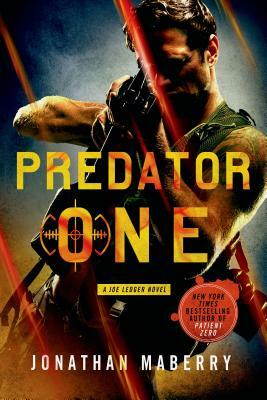 Joe Ledger and his team are back in Jonathan Maberry's seventh book in the series. They begin a desperate search for the secret to this new technology and the madmen behind it. But before they can close in the enemy virus infects Air Force One. The president is trapped aboard as the jet heads toward the heart of New York City. It has become PREDATOR ONE.